The April sun was sinking lower over the snowy San Gabriel Mountains when County Deputy Callum MacLamond rode down to the stage road and headed west for the Ravenna mining camp at the head of Soledad Canyon. He knew he could get supper there and a place to sleep before heading back to Los Angeles to report his killing of Two Fingers and Gomez at Little Rock Creek. The two swigs of whiskey he’d had sitting up on the low ridge above the rushing creek had energized him, and at the same time helped calm him following the gun-fight with the two killers who had murdered the old prospector up by Fort Tejon. It also stirred a wayward desire to head back to the ranch where he and young Mrs. Resi Schmidt had been together only the night before, with the ranch and the desert wild flowers covered by the sudden snow-storm. But he knew that was a forlorn hope. The old ranch-hand would most likely be back by now, and the Sheriff would no doubt be wondering what the hell was keeping him. He passed a four-mule-team wagon heading east, the driver and guard giving him a friendly greeting, happy no doubt to see the Law on the same lonely road as themselves. There were still patches of snow all around, and a cold breeze blowing. The carpets of poppies and gold-field were closed up tight. Jack rabbits and cotton tails hopped away among the junipers and Joshua trees, and ahead of him a covey of quail in single file streamed quickly across the deep rutted, muddy road. High above, a large red-tail hawk wheeled slowly against the blue afternoon sky. Cal wondered if the grizzly he’d seen on the way in was still prowling around. He smiled, thinking that in springtime the desert foothills were like riding through a big open-air zoo: some cute critters, and some killers. Up the long grade to Soledad Pass gangs of Chinese coolies and other workers were preparing the road bed for the Southern Pacific’s steel rails that would soon be laid there. The wide valley to the south opened before him, a long snow-covered ridge looming above, the crest crowned with a thick forest of pines. Following the road along the rail line he came to the large stand of cottonwoods at the mouth of Soledad Canyon. Sporadic copper and gold mining over the years had produced a cluster of cabins and tents under the shade of the big trees. It had taken on the name of Ravenna, after the Los Angeles merchant who had run a nearby saloon for many years. Cal had a hunch that the old saloon would still be there long after the miners had all packed up and drifted away. Leaving Big Red, saddle and carbine at the small livery stable run by an old ex-Confederate he knew and liked, he washed up, then walked over to a long, ramshackle building where there was a cafe he’d stopped at many times before. A young Welsh miner and his wife owned the place, and it had two main attractions for Deputy MacLamond: the spicy hot chile with pork; and Rosa, the very friendly and very pretty little Mexican waitress. Once upon a moonlit summer night, the two of them had spent a very pleasant three hours with a bottle of wine in her tiny cabin by the creek. He was not the first to enjoy Rosa’s company at midnight beneath the rustling cottonwoods, nor was he the last. Which was fine with him, especially now, with the memory of Resi’s sweet blue eyes and eager kiss fresh in his mind. He enjoyed his bowl of red-hot chile, as always; had a glass of wine, laughing and flirting with Rosa. But she could see that romance was not on his mind this trip, and saved her special attentions for a young teamster from one of the big supply wagons. “Always,” he said, and stepped out into the snowy, cold spring evening. Moonlight was dancing on the leaves of the big cottonwood trees, and the good smell of supper cooking drifted through the quiet grove. In a separate stand of trees some distance away a campfire flickered, and a lone Chinese voice could be faintly heard singing a kind of sad melody. Cal wondered what Resi was doing. Was she thinking of him? He remembered her naked figure by candlelight, and figured there was no doubt she was thinking about him, and remembering last night. The air was icy, and after he rented the wood-floor tent for the night, he decided he was in the mood for a drink and some friendly conversation before he went to bed. So he walked up the snow-streaked road to a long, low building with a sign that read, Soledad City Saloon. Pushing through the doorway he saw two miners he knew sitting in the dimly lit part of the room near the end of the bar. In the more brightly lit section every table was taken up with card players, mostly Americans. Five Mexicans were at a table over in the back corner. He thought they always seemed to laugh more when playing cards than the others did. The Americans were very serious over their cards. “Same old thing,” Cal said. “Chasin’ the bad hombres.” He laid money on the bar and asked for his usual double whiskey, then carried his drink over to where the two miners sat. He plunked down wearily, pushing back his broad-brimmed Stetson. “Oh jolly good!” The Englishman raised his glass. As was the Western custom in mining camps and elsewhere, there were no further questions as to details regarding the young deputy’s love life, or the dead outlaws. The two miners knew the latter question would probably be answered in due time by newspaper. Or hearsay. The miners replenished their beer. 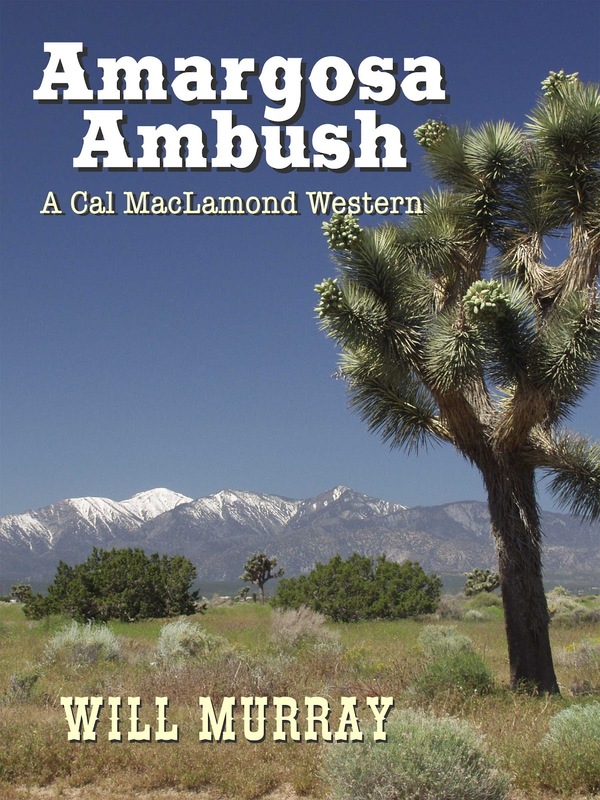 Cal slowly sipped the rest of his whiskey as they discussed the perennial question as to whether the big copper mine would ever re-open, the ongoing search for gold, and life in the camp and down in the Pueblo of the Angels. Then just as Cal was finishing his whiskey and getting ready to bid his friends adieu, two loud, obviously drunk teamsters barged in through the doors and made their way to the bar, laughing and calling for service pronto. I'll be offering Amargosa Ambush as a free download on Kindle for about 48 hours Wednesday September 12 & 13th. I'll keep you posted!